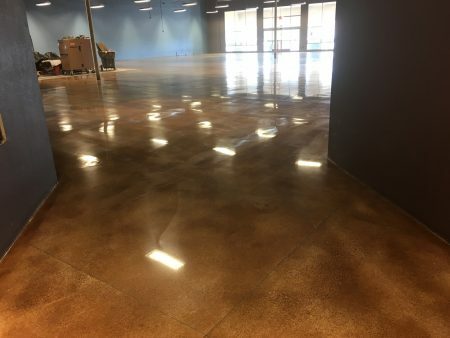 If you want your concrete to shine, look no further than the concrete polishing systems from Sacramento’s California Custom Coatings. Our concrete polishing method uses cutting edge concrete technology to stain, polish and then protect your newly colored concrete floor. Our process starts with an aggressive grind of the concrete’s top layer to eliminate any spots and imperfections. While grinding, we use top quality industrial machines that vacuum all the dust produced to keep if off the floor and out of the surrounding air. After grinding, areas with deteriorated, cracked or faulty concrete are refloated to guarantee a solid and level surface. These steps prepare the floor for a thorough and lasting infusion with your selected color. The grinding process also guarantees the strong adhesion of floor sealers that create a virtual mirror finish. A multitude of colors are available, and a thicker application of the clear protective layer is available where heavy traffic is expected. Concrete polishing thus offers the ultimate in decorative durability, for both home and business, while simultaneously providing chemical and scratch resistance. This technique is easily the best for businesses wanting a good-looking, durable, and low-maintenance floor surface in their commercial or industrial facility, or homeowners wanting a beautiful, easily cleaning option. For more information about your choices in concrete polishing and for a free estimate, contact California Custom Coatings today! contractors who were to do other parts of my garage. I was super impressed with all the tools they used and I was immensely happy I didn't go with one of the kits from a hardware store. The most important tool is their diamond cutting tool which prepares the concrete for the epoxy by making micro cuts into the concrete so it will stick better.